When Margaret first entered the Food Service Training Program, she was nervous and unsure of herself. In the time she has been in the program, she has learned the various stations in the cafeteria and has transformed into a confident individual. She enjoys waiting on customers and performing her daily tasks. 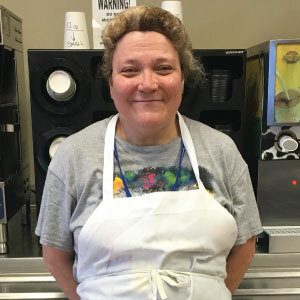 She shows good customer service, makes special orders that require memorization, and helps individuals who have difficulties carrying their trays. The staff describes her as bursting with enthusiasm and a great help to the cafeteria! Click here to learn more about Goodwill's Food Service Training program!